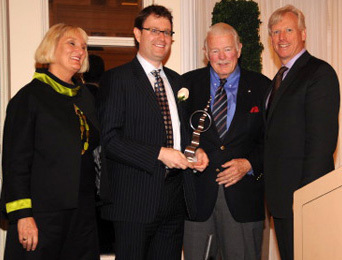 Torys is delighted to announce that we received The Globe and Mail Toronto Business for the Arts Award 2008. The award, presented in association with the Toronto Arts Council Foundation, honours Torys' pro bono work with CARFAC Ontario (Canadian Artists' Representation/le Front des artistes canadiens) in operating the Visual Artists' Legal Clinic of Ontario (VALCO). Eric Boehm, the founder and director of VALCO, received the award on behalf of Torys at the Mayor's Arts Awards Lunch today from Toronto Mayor David Miller. Since 2005, more than 30 of Torys' lawyers have advised artists on a pro bono basis through VALCO. Most of those artists would not otherwise have afforded legal representation. Left to right: Claire Hopkinson (Executive Director of the Toronto Arts Council Foundation), Eric Boehm, Dr. Jim Fleck (Chairman of the Council for Business for the Arts in Canada, and President of the Art Gallery of Ontario Foundation), Mayor David Miller. Click here for further information about the Mayor's Arts Awards Lunch 2008. Click here for further information about Business for the Arts. Click here for further information about VALCO.